In today’s commercial washroom environment design is becoming a big factor within the specification process, whether it be the integration of latest technology or design-led products. There are many products on the market that can create a smart and unique washroom to suit any budget. We explore why this process is so important and how setting the scene in washrooms can have an impact on the experience. In most cases, people believe that the washroom isn’t the forefront of people’s minds when they are leaving a review for an establishment such as a hotel or retail space. However, washrooms can be the first and last thing a customer or a visitor see’s, particularly in retail environments, hotels or even employees at work in offices. They will often report on the cleanliness, food, staff or other features of the building, therefore the right design and style could just be the ultimate factor in leaving a long-lasting impression. The character and atmosphere of any washroom are arguably one of the biggest influences on leaving a long-lasting impression. Design considerations such as lighting and decor are top priorities for the task of creating an extraordinary experience. Warm and soft lighting in a hotel can give a luxurious homely feel, whereas a shopping centre or an office would benefit much more from a brighter light. Extra details like mirrors and matching accessories can also be added to make the washroom feel like an all-important part of the building and much more than an afterthought. Decor has a huge impact on the setting, quirky and memorable designs will definitely fill the washroom with character and personality. Business Insider UK has published 15 incredible hotel bathrooms, which emphasise the importance of style and decor. From cave to cruise, the best washrooms are the ones that look and feel great…. The feelings of customers and staffs can be highly influenced by the hygiene standard of the washroom. A clean, tidy and fresh environment can leave a positive impression, whereas poorly maintained and mismatch washroom can leave quite the opposite. This is especially apparent in restaurant and hotel environments. According to cleaning matters “Cleanliness is critical when it comes to protecting your brand. It impacts your customers’ experience and perceptions, affects their loyalty, and influences what they tell friends and family.” A survey from Facilities Management Journal also revealed that 87% of people believe that an unclean washroom has a negative impact on our overall impression of an establishment. When it comes to leaving feedback, the cleanliness of your washrooms could be detrimental in receiving positive reviews, even if staff and frontline services are outstanding. It is also important to consider all-inclusive design in any public or semi-public washroom environment. Sanitary accommodation should be designed and available for all types of users. A number of design factors should be considered within the washroom environment particularly relating to the needs of people with physical, visual or hearing impairments. Therefore, in order to be the most user-friendly and compliant, design considerations should include aesthetics, durability and the user’s specific needs. The appearance of the washroom can often be dominated by the use Doc M compliant products, however, with new innovative products on the market, unsightly washroom experiences can be a thing of the past. New products have not only introduced style, but colour, quality and space into the modern less-abled washroom, providing a pleasant experience. So even if the less-abled washroom is the only toilet available within a building you can still provide a stylish washroom that is perfect for all users. Washtroughs and basins are the forefront of any washroom and there are a wide variety of products available to create a timeless design. 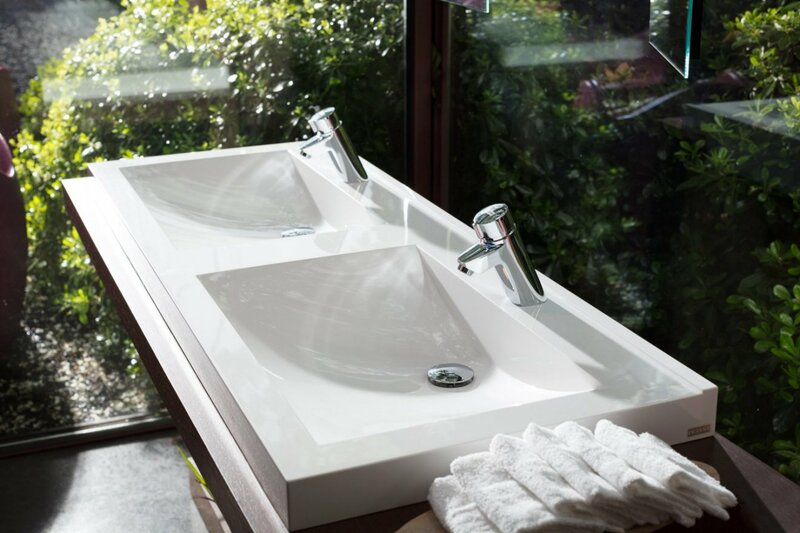 More recently architects and industry professionals are using solid surface washbasins and vanity units in order to deliver a more contemporary design with a luxurious feel. The Franke range of Miranit solid surface products is perfect for designing stylish yet easy to maintain washrooms. The core range consists of Ronda and Quadro basins and a range of washtroughs. Thanks to the materials exceptional moulding qualities these products can also be bespoke and completely unique to what you require. It can be manufactured into almost any shape and colour to produce a wonderful washroom experience. Miranit has exceptional hygiene qualities due to its smooth, pore-free surface and seamlessly moulded design. See some examples of Franke Miranit products below. From standard to bespoke, this wonderful Miranit product is elegant and durable with endless possibilities, it has been designed to cope with the harshest conditions, and is suitable for any type of washroom, from executive offices to leisure and sports facilities. Breaking away from traditional styles and furnishes can separate your washroom from the rest, whatever the specification or budget there are products on the market to really make the washroom stand out. Adding coordinating ranges of accessories such as matching soap dispensers, hand dryers and waste bins can bring the room to life and add value to the whole washroom.